So you’ve got a hammock and don’t have the iconic trees to hang them from? It’s not a problem at all! A lot of hammocks can be used in free-standing frames that eliminate the need for the perfectly-spaced trees. Some even come with hammocks! Our hammock stand buying guide will help you choose the stand that is right for you! Let’s look at some of the things you should know before you start your shopping adventure! Material: This refers to what the stand is made of. Most are made out of steel that will be durable and hold higher weights, while wood stands are more classic and look great no matter what hammock you put on them. 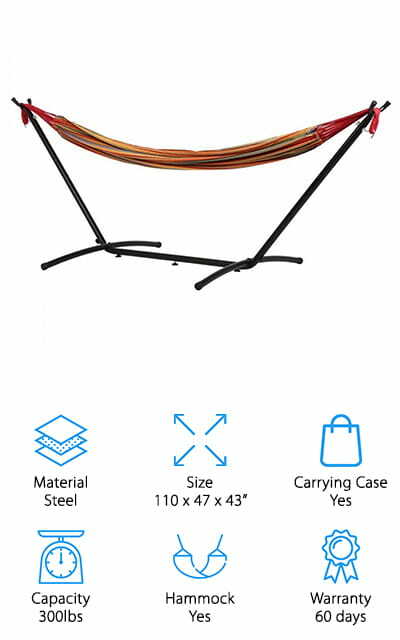 Size: The dimensions of the stand are important when determining if the hammock you have will fit, or what size you need to buy if you have to purchase one. It also helps determine where it’s going in your backyard. Carrying Case: Some stands will come with a carrying case to keep all of your relaxation accessories together. This allows it to be portable so you can take it with you on vacation or to the beach. Capacity: How much weight can the hammock stand tolerate? These are usually pretty high and double in hammocks meant for more than one person. Don’t exceed this weight if you don’t want any issues with the way your stand functions! Hammock: Some stands, including the majority of the ones on our list, come with hammocks that specifically fit their specifications. They also come in multiple fun colors in most cases! Don’t buy a separate hammock until you know. Warranty: If your purchase has any defects or manufacturing errors, the warranty covers you for the period that it lists. Get your hammock stand refunded or replaced with no extra hassle with most companies. Don’t suffer a defective product! Now we can show you our best hammock stand reviews! We’ve researched and reviewed a selection of stands to bring you the best ones being sold right now. If you’re in a hurry to get back to relaxing, take a look at our top pick and budget pick first. You’ll get a pretty good idea of what the rest of our list has to offer! Let your cares drift away and let us help you choose a hammock stand! 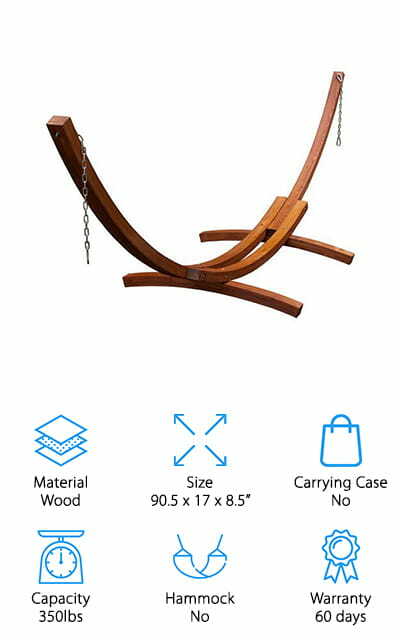 This Vivere Hammock Stand is our pick for the best hammock stand for sale right now! It’s made of heavy-duty steel that can hold up to 450 pounds at once – it’s recommended to use it with a friend! The legs are coated with zinc so it won’t rust, and the ends of the tubing are capped off to make them softer, so you won’t hurt anything by running into them. You can also move it with ease, without damaging your patio surface. Set it up anywhere! There’s even a carrying bag to take it with you on the go. It comes with a hammock, so you don’t have to buy a separate one, and comes in about 17 available colors. It has long-lasting polyester end strings that will hold up to use, and you can adjust the hammock’s height really easily. Pack it all up and take it on an outdoor trip for relaxation anywhere. It’s lightweight! The Best Choice Stand is made of steel coated in resin so that it’s good for all weather and both indoor and outdoor use. It’s durable enough to stand up to frequent use! The 450-pound capacity supports two adults, so you can relax with a friend or loved one as well. The frame is wide enough and strong enough that you won’t have to worry. Set it up in your living room for a cool bohemian vibe, if that’s what you’re going for! 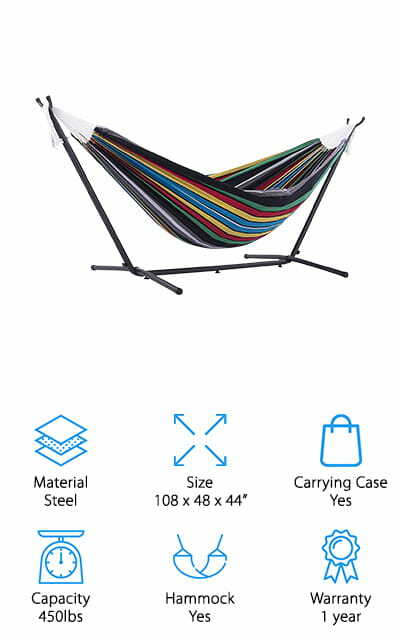 The hammock that it comes with has 7 color options and is completely cotton so you can relax in comfort. It’s so easy to set up that it’ll only take a few moments to go from unboxing to relaxing. It comes with an accessory tray as a neat little addition, as well as a carrying case to take the lightweight set with you. It’s the best cheap hammock stand on our list, and for good reason! This stand from Petra might be one of the best hammock stands that we saw in our research. It’s a wooden stand that has been water treated so it won’t get damaged in the rain, and stained with a teak wood finish! It’s simply beautiful and can hold up to 450 pounds. Two adults can easily rest on a hammock in this stand. It’s 14 feet long, so even the tallest people can stretch out and take a load off. 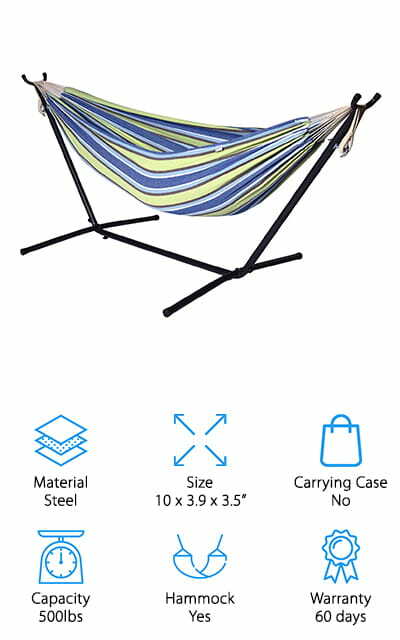 It comes with a completely cotton hammock that is weather and fade resistant. This quilted and padded hammock comes in three color options and has the hardware to hang across trees if you’d like to do that as well! The colors won’t run or fade, and your hammock and stand will stay looking great and feeling good for a long time to come. And if you’d like a different stain, they have so many options! Choose your favorite! This stand is the first on our list to not come with a hammock included. However, this is an amazing, versatile stand that can be used to hang a variety of hammocks. You can hang hammock chairs from it, spreader bar hammocks and the ones without spreader bars as well. 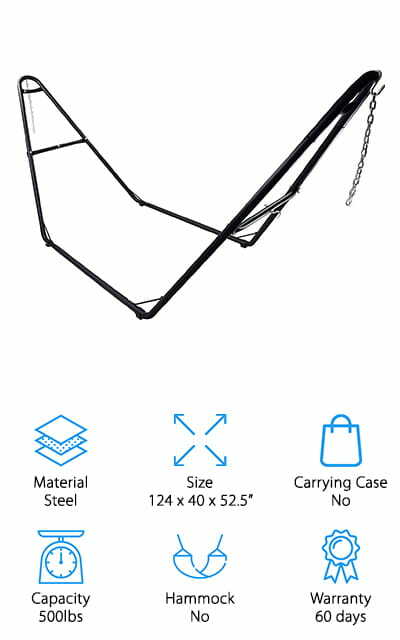 The capacity of this stand is an amazing 550 pounds, so if you buy a double hammock, it’s sure to be able to accommodate you and a friend! It’s made of extremely durable, heavy-duty 12 gauge steel, with a rust-resistant finish. It’s coated in black powder to help with that. You can put it up in minutes, and hang your hammock in seconds. It comes with a carrying case for portability. 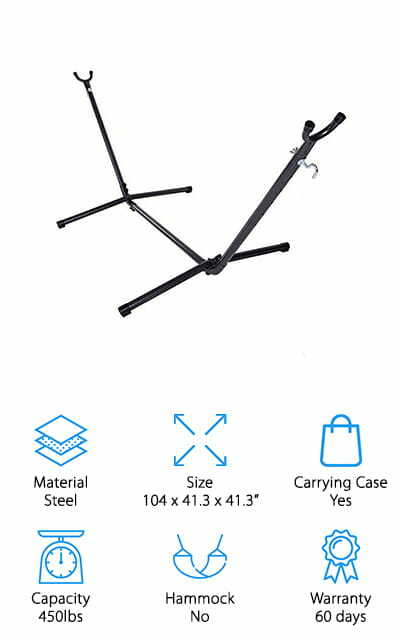 It’s a great lightweight hammock stand that you can take with you anywhere. It even has extendable chains and heavy hooks to fit just about any of the hammocks that you could own. It’s so versatile! 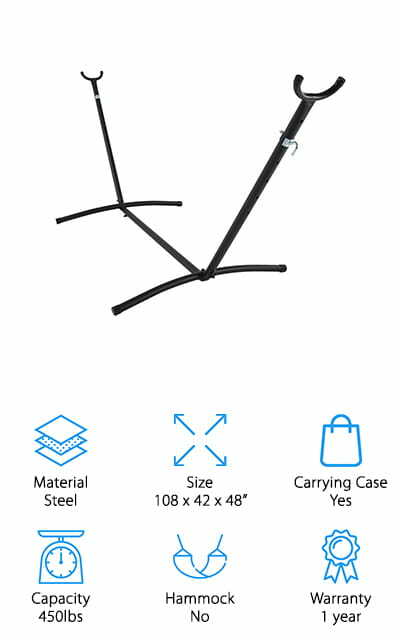 The OnCloud Hammock Stand is constructed of durable powder-coated steel, capped off with plastic ends to keep the tubing and your surfaces safe from scratching or damage. Each end of the stand has six holes so you can adjust where you want the hooks, and each of these holes is 4 inches apart for an astounding amount of customizability to your hammock experience. You can set it up in less than 10 minutes, as it doesn’t have very many pieces or complicated instructions. When you want to move it, simply break it down and put it into the carrying case that is provided. It’s a small stand that’s only 9ft long, which will definitely save you space if you want to use it inside. It will fit all of your non-spreader bar hammocks beautifully! 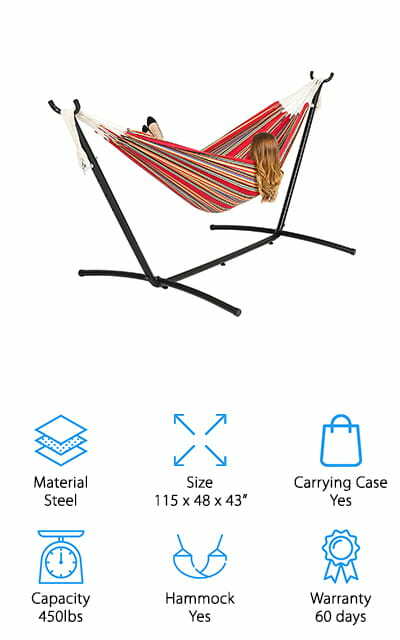 Because of the smaller size and compact nature of this stand, you might need to buy a new hammock that hasn’t been used. Bonus! The Sunnydaze Stand works incredibly well for non-spreader bar hammocks that are within a 10 to 12.5 feet range in length. Take that into consideration when purchasing a hammock! It’s created to hold Brazilian-style pieces, so it’s shaped a little differently. The frame’s U-shape helps hold the hammocks in place as long as they fit the specifications. It’s made from steel tubing with a powder coat finish that’s durable and heavy-duty. You won’t need any tools for assembly, and has a 450-pound weight limit so it can accommodate you and a friend! We love that you can set it up without needing so much as a screwdriver! Use the included caps to cover the ends and prevent damage to yourself or your surfaces. This stand can adjust to fit five different positions, which is a pretty big range of accepted hammocks and styles. We love the unique Brazilian U-shape that will help keep your hammock in place! Ivation’s Hammock and Stand Set is the best portable hammock with stand that we looked at or found during our research. It’s lightweight and portable enough that it doesn’t take but a few moments to completely set it up or break it back down if you need to take it with you on a camping trip or want to move it outside. The stand is made of construction-grade steel that is completely weather resistant. It can hold up to 500 pounds comfortably, which is definitely a bonus. The hammock is huge, and can comfortably fit the recommended two adults with plenty of room to spare. It’s so strong and comfortable that your cares will fade away while using it. Get ready to chill out when you get it, because it sets up so quickly you’ll be relaxing in no time. And you won’t need any tools, because all of the knobs and pieces can be hand-tightened together. This set is unique because you can buy it in either red or blue, but you can also use your own hammock and just buy the frame. The stand itself is made of steel and can be put together in a matter of minutes without the use of any tools necessary. It is 9 feet long, so it will accommodate the hammock that comes with it or any other smaller hammock with no spreader bar. It can hold 300lbs, so take some time to chill by yourself! It includes a nylon carrying bag so you can take it with you when you go camping or to bonfires on the beach. It’s even great for indoor use, so take a load off just about anywhere! The included hammock is 100-percent cotton, so it’s comfortable and durable. You may never want to leave! This is definitely one of the best outdoor hammocks with stand sets on our list. The Algoma Arc is made of beautiful wood that is arched slightly, a lovely design that will look great in your home or just outside it! 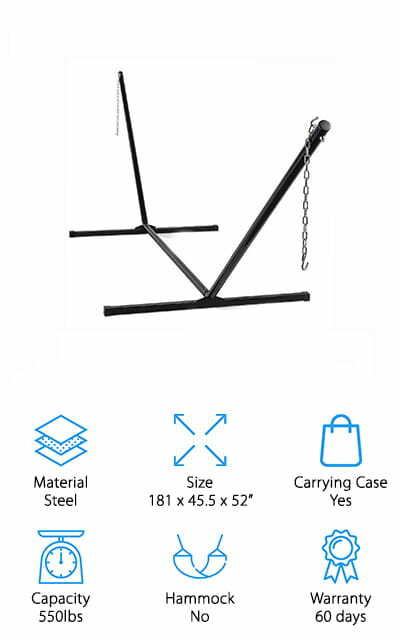 Most spreader bar hammocks will definitely fit on this stand, so if you have one already, that’s really good news! It includes all of the stuff you’ll need to hang your hammock once you have the stand assembled. It’s a 15-foot long stand that’s made of Russian Pine, so it’s a gorgeous finish on a heavy-duty product. We love it! 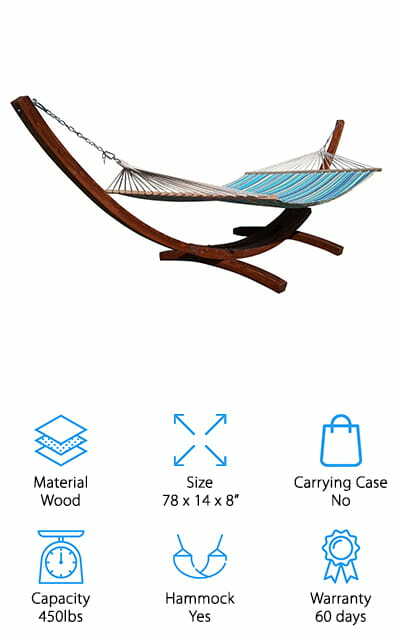 It’s more than just that, though – it’s also a really beautiful piece of furniture that looks unique to other hammock stands. Add some class to your yard or your hangout space with this unique and beautiful stand. And we really appreciate that you can use your own spreader-bar hammock, which is the most common American model. This is definitely one of the best wooden hammock stands that we have reviewed! The Sorbus Universal Stand supports the use of the hammock you already love! It fits most hammock styles, which is something we didn’t see a lot of on our list. It has adjustable chains and hooks that will fit Mayan, Brazilian, camping, and spreader-bar style hammocks. There’s probably even a way to fit a hammock chair on this thing! It’s durable and will last you for years! The metal loops are incredibly durable, and the entire frame is resistant to weather and rust. The button-snapping mechanisms keep this thing together, so you won’t need to use any tools other than your own two hands. The capacity is an amazing 500 pounds, so you can get two people on your hammock quite easily when using this stand. All of the hardware and instructions are included – even the plastic feet to help stabilize and protect your surfaces. We love how many different styles of hammocks this stand can accommodate!